House Cleaning Gift Certificates, Mint Victoria Professional House Cleaning in Chanhassen and Eden Prairie. Give your loved ones the gift of free time. Struggling to find that perfect gift? One that strikes a balance between something meaningful, yet practical? Mint Victoria gift certificates are a smart choice for new moms, grandparents, and anyone who's short on time. House cleaning gift certificates mean less chores and more free time, who wouldn't love that? Our house cleaning gift certificates can be used towards any of our house cleaning services, with the same satisfaction guarantee and commitment to flexibility we've become known for. 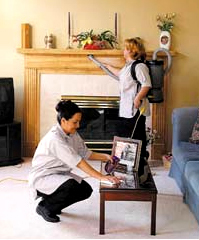 Voted best housecleaning company in Chanhassen and Eden Prairie. Trust your loved ones in our hands, and we'll make sure it's the best gift you've ever given.